You do not have to be a professional jewelry designer to make stamped metal projects. Create beautiful accessories using a basic metal stamping set and these designs. You won't break the bank on these projects as they all use recycled or inexpensive supplies. Your investment is in reasonably priced tools that can be used over and over again. Each of these projects uses the same basic metal letter stamping set and a Crop-A-Dile tool. These designs are perfect for anyone who knows the basics of metal stamping, or is looking for a good first project to try. 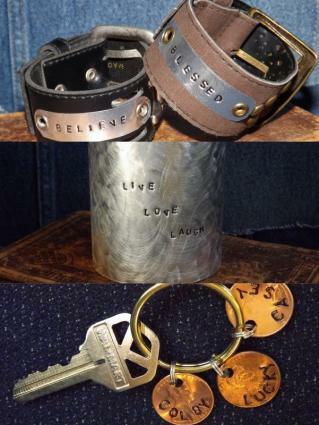 Recycle your old leather belts or stock up on belts from yard sales and thrift stores to make these fashion bracelet cuffs with metal stamped, inspirational words. Thread the end of an old leather belt through the buckle. Place the belt on your wrist and cinch it until it fits comfortably as a cuff. Using household scissors, cut the belt approximately 1/2 inch to 1 inch past the belt loop. No two belts will be cut exactly the same length since the design, texture, flexibility and belt loop placement may differ. Using scissors, cut a 1/2-inch wide by 2 1/2-inch long strip from a disposable aluminum oven liner. Round the corners. Choose the word or words to stamp on your cuff. Write out the words and determine the center letter. Begin at the center of the aluminum strip with the center letter and stamp your way outward. This will ensure your word or words will be centered on the strip when stamping is complete. Note: One tap is usually all you will need to stamp aluminum. Trace the inside of each stamped letter using a fine-tip, black, permanent marker. Using a wet rag, wipe over the word to remove any ink that may be outside the stamped edges. Hook your cut belt into a cuff shape. Using the 1/8-inch punch on a Crop-A-Dile, punch a new hole on the belt for the buckle tongue. Position the aluminum strip on the cuff. Using the 3/16-inch punch, punch a hole 1/4 inch from the end of the strip and through the belt. Repeat on the other end. Insert one of the eyelets through the holes on one end of the aluminum strip from the front to the back of the belt. Attach the eyelet using the eyelet setter on the Crop-A-Dile. Repeat on the other end of the strip. This stamped metal candle sleeve looks impressive, but is super simple to create. Make a set for yourself, then keep a stash handy for last-minute gift giving. Cut a 3-inch wide by 9 1/4-inch long rectangle from a disposable aluminum oven liner. Oven liners rarely have a completely smooth surface so you will most likely have ridges or designs embossed on your rectangle. Place the aluminum rectangle on a cutting board. Tap over the entire surface using a hammer. This will create a new texture to the surface while removing the embossed ridges and designs on the liner surface. Using 150-grit sandpaper, sand the entire surface in a circular pattern. This will give the surface a soft, brushed-metal look. Apply texture to the metal. Choose your word or quote. Starting from the center of the rectangle and the center of your words, stamp the words. Trace inside each letter using a fine-tip, black, permanent marker. Wipe off the excess ink around the letters using a damp rag. Form the rectangle into a tube shape, overlapping the short ends 1/2 inch. Punch the overlap 1/2 inch from one open edge of the tube using the 3/16-inch punch on the Crop-A-Dile. Insert an eyelet from the outside to the inside. Attach using the eyelet setter on the Crop-A-Dile. Turn the tube over. Punch and attach an eyelet through the overlap on the other edge of the tube. Place the tube sleeve over a votive holder. Do you need a simple gift for Mother's Day or Father's Day? This quick, stamped accessory literally costs pennies to create and would be a great project for kids to help make. Place a penny on a bench block with the head facing up. Center the "C" stamp on the bottom edge of the penny and firmly tap with a hammer. Several taps may be necessary to get a good clean impression. Continue tapping the rest of the word "LUCKY" on both sides of the "C." Stamp more pennies with the names of your special people. Trace the inside of each stamped letter using a fine-tip, black permanent marker. Wipe off the excess ink around the letters using a damp rag. Using the 1/8-inch hole punch on the Crop-A-Dile, punch a hole on the top center of each penny. Attach a split-ring jump ring to each penny. Attach each penny to a 1 1/4-inch split-ring key ring. When cutting aluminum, wear gloves to protect your hands from cuts. If the edges of the aluminum feel sharp or rough after cutting, lightly file using an Emory board. Different eyelet sizes can easily be substituted as long as your punched hole is the same size as your eyelet's inner diameter. These projects use softer metals and are intended to be easy enough for a beginner to achieve success. Practice with these metals before graduating to harder or more expensive metals.